1. Do as your barber does. Soak a towel in hot water, wring out all excess water, and press it over the beard area for 30-50 seconds. If you’re running low on time, shave in or right after a hot shower. The heat and steam opens pores and softens the beard, offering a closer shave. 2. Use a pre-shave conditioner. Pre-shave creams, gels and oils help lubricate and protect the skin so that the blade(s) glide over smoothly. 3.Brush away. It’s old school, but it’s a trick that’s lasted through the ages because it works. (Do as dad and pop have always done!) Using a brush to apply shaving cream builds a thicker lather while raising every little hair so you get the closest shave possible. If you don’t shave every day, brush the beard area during that in-between period. Work it in circular motions to stimulate the skin and help prevent ingrown hairs. 4. 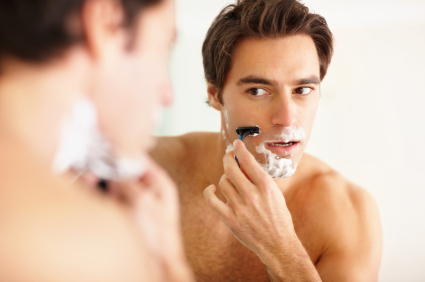 Remember: going against the grain gets a closer shave, but it’ll irritate your skin more. Try shaving in the direction your hair grows, washing your face, re-lathering, and making a second pass across the grain. 6. Follow up with a good moisturizer. Preferably one with Aloe, Oatmeal or Lavender Extract to help soothe the skin. PS. Enjoy a special holiday treat with our Peppermint Shaving Cream. It’s a great gift idea, too! If you’re shaving for the first time in awhile after you’ve grown a beard, consider getting a trimmer to get it down to length before shaving it. Otherwise you may end up with a wicked hack job. Otherwise, good article – not enough people take the time to shave properly and apply the correct creams/oils/etc.